Spread is Temple -10.5. Seems about right. With non-Saints Super Bowl, maybe we'll see some local media at game tonight? ““We had the wrong guy taking the ball out of bounds, and that was one part of it,” coach Mike Dunleavy said in his postgame radio interview. “And then we should have been holding for one shot. We gave (away) that momentum going into the half”. I’ll give him this, Dunleavy is correct in observing that whoever is coaching the team is not doing a very good job. They're going to be covering the boycott parties. Seriously, I can't tell if this means MD wasn't coaching the right moves in the game, he hasn't prepared them well enough in practice, the players are tuning him out or the players don't have enough basketball IQ, but whatever he's trying to say it's not good. Is Vegas giving away a free 18% on your money with a -550 Temple Money Line? I'm going to have a beer every time we turnover the ball tonight. I expect to be drunk by halftime the ten minute mark. 4-16 record. I have been building up to this. Watched the first 2 minutes and felt like hurling. So, shut it down. 9-0 early. 4 easy baskets for them. Turnovers galore already. Why are we playing a senior guard that can’t play defense and turns it over so much? He has 3 in 4 minutes. I’m a Philly guy by osmosis. We don’t belong on the same court and I take no pleasure in saying that. Temple is faster, tougher, stronger. Dunphy has forgotten more about college basketball tha MD knows. Wood hit a 3 and apparently has made 13 of his last 15 shots. He is really starting to play well. Down 8 at the half. It’s nice to see the emotion shown after the Sehic 3. We played some zone and it was somewhat effective. The effort was there tonight just not the execution. I’m a huge Sehic fan but it seemed like he could have his way inside and instead we kept running pick and pops where he ended up with 3 point attempts he just wasn’t hitting. so, how are you holding up after 15 beers? After 3 turnovers early I switched to 1 beer for every 3 turnovers. It does make the game interesting. Next game is 1 shot every time announcer mentions Dunleavy and the NBA. The season is so bad they are touting the team GPA. It is impressive but I’m thinking if we were 17-4 instead of 4-17 it wouldn’t get mentioned. After 3 turnovers early I switched to 1 beer for every 3 turnovers. Where is your sense of commitment? Actually, if you want to stay out of the ICU, you could do it like "Bob" and just do a shot of beer for every turnover. We did "Bob" a few times in college and I got pretty hammered one episode. I think the rules were 1 shot of beer any time someone said "Bob", 2 shots for "Hi Bob" and 3 if Bob said his own name. There was one episode where Newhart did his typical one man act on the phone and said "Hi yeah, this is Bob. Bob... Bob Hartley. I said Bob.. that's right... B O B.. Bob" Good times. We made a drinking game for the first pirates of the Caribbean right after it came out on DVD: after every time they say pirate you had to yell "arrrrrr" and take a swig of beer. They say parlay you yell "parlay" and take two swigs. When they're on the island drinking rum you switch to rum until Jack sparrow says "but why is the rum gone?". Of course, there was also the boondock saints one where you drink every time they say "f#ck" or some variation of the word. Great student turnout and if Tulane had not gone in the hole immediately, it could literally have had a home court advantage and perhaps done some damage on the Owls. 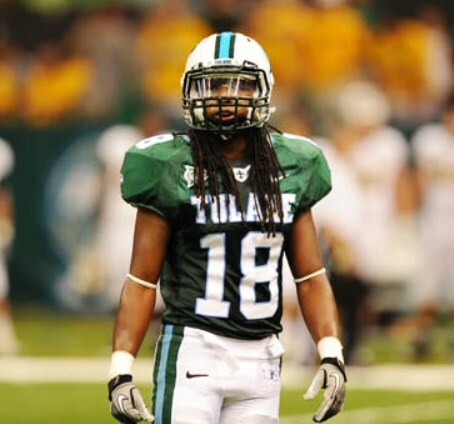 Sidelight: Luther Strange, Bolyard, Bobzein and other 70's Tulane athletes showed up tonight. This may be a first. I've seen lots of basketball games lost in the last two minutes like say Thursday night. This one was in the first two minutes. Tulane turned the ball over its first five possessions and Temple made its first six shots (if you don't count a jumpball/block midway.) The game was literally over at the two minute mark. Tulane never got closer than five or six again in the game but had to play catchup/desperation catchup/catchup for the final 38 minutes. Easy to lose and hard to win with starts like that (and I guess finishes like ECU). Thank you for the excellent summation. I’m in the process of texting an old friend in Philly, a Temple law alumnus, and I look up and it’s 9-0 while people are still finding their seats. The first layup by the Cherry and White put the term matador defense to shame. Sure, the accordion squeezed here and there but the lead was never in jeopardy for Dunphy’s crew. Ten minutes in and my wife and I resumed watching DCI Banks on Amazon Prime. I tried watching DCI Banks.. it just didn't hook me in. I quit after 1 episode. Probably because I was such a strong fan of Luther and it was a similar series. Your wife watches Tulane basketball with you? Trying to get her to break up with you? It’s like the placard I saw on an Ocean City, MD boardwalk bench: “Ginny loved watching the ocean and I loved sitting next to Ginny”. Yup, Luther was in a league of its own. We’ve run through a lot of similar genre: Broadchurch, Happy Valley, Grantchester, Hinterland, Shetland, Unforgotten, Last Tango in Halifax, Peaky Blinders...most with closed caption because some of the UK accents are tough at first hearing.